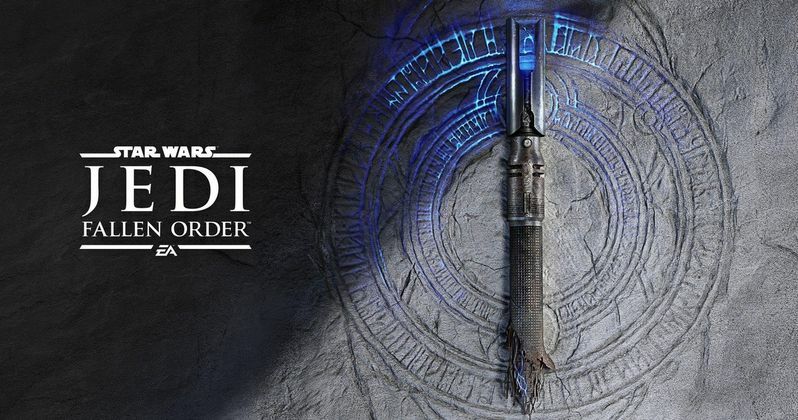 EA and Respawn Entertainment have revealed the first teaser for their upcoming Star Wars video game Jedi: Fallen Order. Ever since Disney purchased Lucasfilm in 2012, the company has focused a great deal on the new movies, their animated shows, comic books, novels and toys. Unfortunately, the video games have suffered quite a bit. That looks to change very soon as this initial teaser promises a different kind of game set within a galaxy far, far away that will be more than an online shoot-em-up. The teaser itself is brief, more of a motion poster. We see what appears to be a heavily damaged lightsaber resting upon a slab of stone with mysterious symbols carved into it. Fiery red embers are seen floating over the lightsaber and the stone, with blue light glistening from underneath the surface below the slab. Ominous as this image may be, it's the caption provided with the teaser that should garner the largest eyebrow raise from fans. Those words surely relate to what little we know about the story. While a full synopsis hasn't yet been revealed, Star Wars Jedi: Fallen Order will center on a padawan who survived the events of Order 66, as seen in Revenge of the Sith. For those who may not recall, Order 66 was the order handed down by Palpatine that all Jedi be executed. While this mission was brutally successful, certain members of the Jedi order managed to escape. "Don't stand out" would be a good motto to follow for any former Jedi who made it out with their lives. In the years before Disney started making new Star Wars movies, the video games were a way for many fans to get new stories set within that universe. Knights of the Old Republic and The Force Unleashed are a couple of examples. However, in the new era of Lucasfilm, we've just had two online shooters with the new takes on the classic Battlefront series, which have served to disappoint a great many fans out there, even if the sequel did do its best to improve upon its predecessor by including a single-player campaign. Still, if there's one area that's lacking in the new regime so far, it's here. Head of Respawn Entertainment, Vince Zampella, and the game's director, Stig Asmussen, will be on hand at Star Wars Celebration for the panel on Saturday, in addition to some yet-to-be-revealed special guests. The panel will take place at 1:30 p.m CT and, for those who won't be on hand at the event, it will be live-streamed. We've included a tweet from the official Star Wars Twitter account below with a link to the stream for Saturday. We'll be sure to bring any new information, and any footage revealed about Star Wars Jedi: Fallen Order as it's made available over the weekend. Be sure to check out the teaser from the EA Star Wars Twitter account below.